The WITS residencies for spring semester are up and running at public high schools throughout Portland and Gresham! Learn more about all our WITS writers-in-residence here. At Franklin High School, WITS writer Alex Behr is working in one of Anne Meadows’ sophomore English classes; Leslee Chan is working in one of Dana Vinger’s creative writing classes; David Ciminello is working in two of Kim Wagner’s freshman English classes. At Grant High School, WITS writer Arther Bradford is working in one of Scott Blevins’ writers workshop classes and Mark Pomeroy is working in one of Trisha Todd’s writing for the arts classes. WITS writer Turiya Autry will teach a condensed April residency in two of Courtney Palmer’s African American Literature classes and two Latin American Literature classes. At Gresham High School, WITS writers James Gendron is working in one of Crystal Hanson’s sophomore English classes and one of Alethea Work’s honors English classes; Courtenay Hameister is working in one of Tina Roberts senior English classes and one of Crystel Weber’s creative writing classes. At Lincoln High School, WITS writer Brian Kettler is working in two of Jordan Gutlerner’s creative nonfiction classes; Amy Minato is working in one of Henry Hooper’s creative writing classes; Lisa Eisenberg is working in two of Amanda-Jane Elliot’s senior English classes. At Roosevelt High School, WITS writer Joanna Rose is working in one of Shawn Swanson’s freshman English classes and one of Deanna Delgado’s freshman English classes; Matthew Robinson is working in one of Tory Rodgers’ freshman English classes and one of Clair Roix’s freshman writer’s workshop classes. 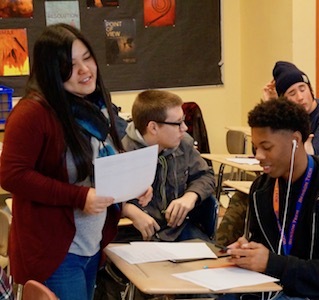 At Alliance High School at Meek, WITS writer Laura Moulton is teaching in one of Amy Taramasso’s classes and co-teaching with WITS Apprentice Zeloszelos Marchandt in a second one of Ms. Taramasso’s classes. We’ll be hosting celebratory end-of-residency readings in the spring, so stay tuned for an opportunity to come and see what students produce this semester!